We have been operating three wild life web cams in a panoramic view of our woods. A small pond, mineral pit and clover patch, attract deer birds and other animals to this small paradise. We have been streaming pretty much 24/7 since last October in Central Minnesota. We recently purchased a domain and website www.deertrail.us. 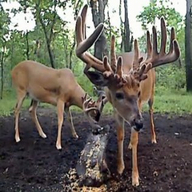 Come Visit the site, interact on the forum, read and comment at the Deer Trail News.